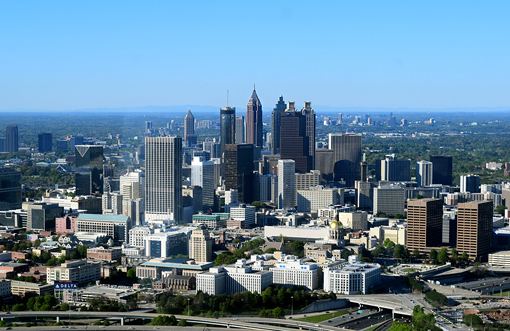 Perhaps the ultimate tour of Atlanta is a helicopter tour of Atlanta! 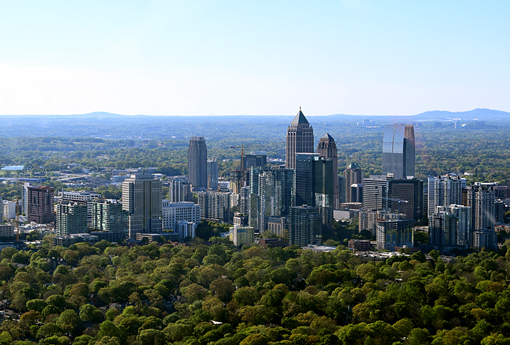 Barry and I recently treated ourselves to a Select Helicopters 45-minute tour of Atlanta, which included the destinations Stone Mountain, Midtown Atlanta, Downtown Atlanta, Mercedes-Benz Stadium, and the King & Queen Towers in Sandy Springs. It was spectacular! I got to sit in the front seat!!! It was so exciting! When I was in 10th grade, I wanted nothing more than to be a helicopter pilot. That didn't work out, which is a story I'll share if I ever write an autobiography, but my love for helicopters never faded. It was fun chatting with our very entertaining pilot, Austin. Flying over Midtown Atlanta was AMAZING! I do not currently live in Midtown (I'm about a 10-minute interstate drive away), but Midtown and Downtown are where I spend a great deal of my leisure time, so I know the areas relatively well. But I'd never seen them from this perspective. I've lived in Midtown a number of times, and would love to move back at some point. One Atlantic Center (formerly known as the IBM Tower) was the newest addition to the skyline when I first moved to Atlanta in 1987. 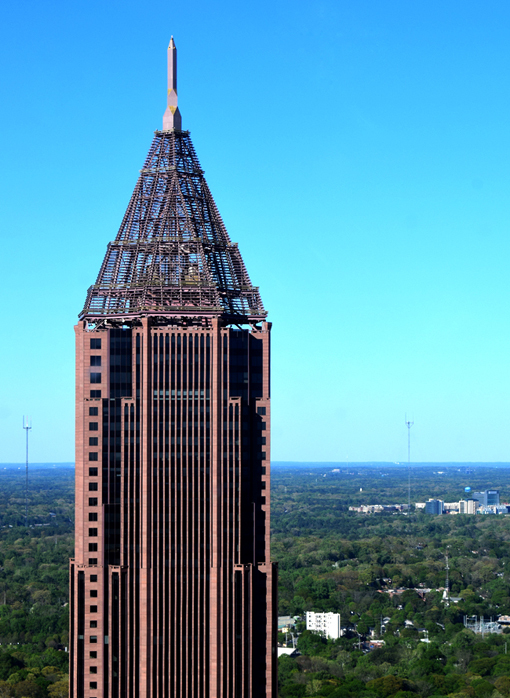 It was also Atlanta's tallest building until 1992. Its glowing copper roof and Gothic flourishes are unmistakable on the evening Atlanta skyline. I wish I had the words to tell you how special it was to get up close and personal with this amazing skyscraper! I grew up mostly in small towns, some quite charming. But, after living in Athens, Greece, I would forever be a "big city guy". I love visiting quaint small towns, but I love the hustle and bustle of a big city. I wasn't sure if we were going to get to fly around Downtown Atlanta on our tour. Depending on major sporting events and other restrictions, it's not always on the tour path. We were fortunate to have amazing weather and getting to see everything we wanted. We even flew directly over Barry's house! If you're a local or if you've been visiting Atlanta for any period of time, you know how quickly our skyline changes. At the lower right of the above photo you'll see a big patch of Georgia red clay. That's where "Pym Technologies Headquarters" once stood (also the former Georgia Archives Building), demolished only days before our flight. I've seen many professional sports live. Baseball, Basketball, Tennis (I've met Andy Roddick and Andre Agassi, and the Bryan Twins), Soccer (I went to two soccer competitions during the 1996 Olympics), Hockey (I've sat chatting distance from Ovechkin's mother while watching the Washington Capitals), but I've never seen a professional Football game. I've long supported the Atlanta Falcons because they're the home team, but I've never seen a live game. 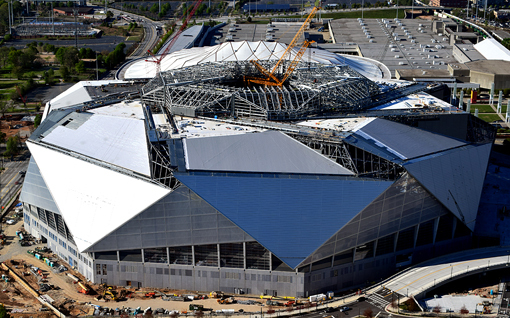 The new Mercedes-Benz Stadium is so alluring, I'm sure I'll see a number of Falcons games this coming season! I've been a soccer fan since high school, when satellite TV first became popular. I'd watch games all over the world and they were on all the time. I first became a fan of Australian Rules Football, and then soccer. Super excited that Atlanta United FC is doing so well...can hardly wait to see them play in Mercedes-Benz Stadium! I'll definitely be attending games--jersey purchase coming up soon! Home to the Atlanta Hawks, Atlanta Dream, and a host of concerts and other events, Philips Arena is an Atlanta icon--I love that they incorporated the word "ATLANTA" into the building's design. They were also home to the Atlanta Thrashers (hockey) before they moved to Canada...I loved that team! Today, the Arena attracts global sensations such as Lady Gaga, Chris Brown and Red Hot Chili Peppers. I've been to so many concerts there I can't keep up, but some of the best were Janet Jackson, multiple tours. Also, one time when I was there for a Hawks game, a little kid walked up to me and asked if I was Larry Bird. Adorable as the kid was, I told the truth, that I was just a fellow fan. I'm tall, but can't pass for 6'9"! If you're a local and wonder where the Liberty Bell and Statue of Liberty replicas formerly located on Capitol Building grounds went, they're now in Liberty Plaza! Go visit as a tourist or come on down and protest, like we Americans do so well. This is embarrassing, but for years after the Bank of America Plaza was completed (formerly known as Nation's Bank Plaza), I kept wondering when they were going to finish the top. As it turns out, the lattice pyramid atop the skyscraper was originally planned to be glass-covered, so I wasn't totally wrong. That's what I keep telling myself anyway. 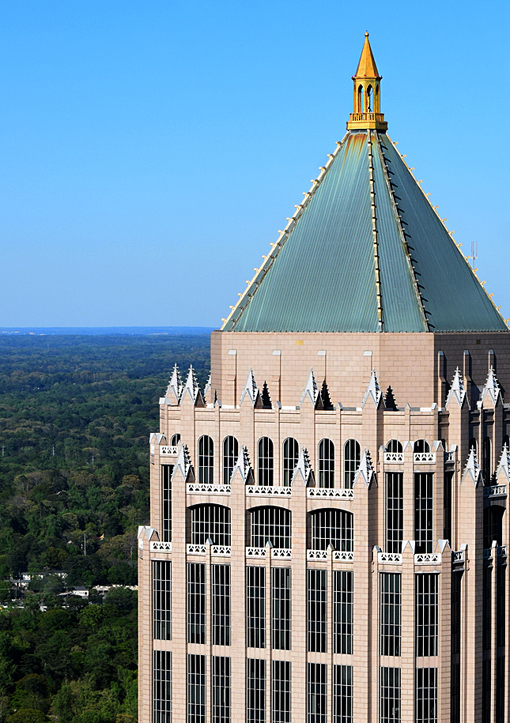 It's been the tallest building in Atlanta since 1992 and I love that it's Art Deco design! You can't miss the eye-catching 90' spire, most of which is covered in gold leaf. 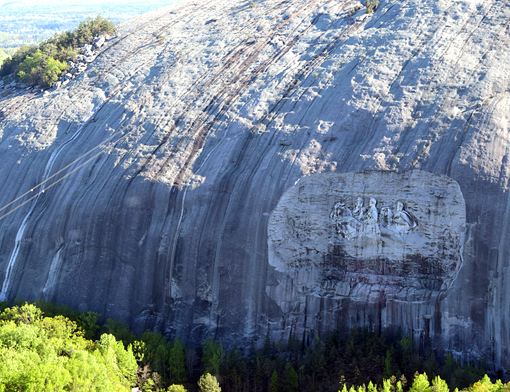 Did you know that Stone Mountain is Georgia's most visited tourist attraction? I'm not surprised...there's so much to do there, year-round! Actually, I'm not at all surprised because I've known that for years and years. When I first moved here in the late 80s, it was one of the first attractions I visited...and, yes, I climbed to the summit, more than once, on foot. 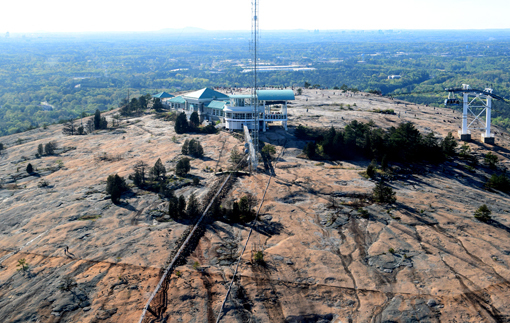 The view from the top of Stone Mountain is spectacular, but the view of the top of Stone Mountain from a helicopter is even better! Wow! A staple of Atlantan summer entertainment is the Stone Mountain Laser Show, complete with popular music, fireworks, and fire effects! Bring a blanket and a picnic...it's a great evening on a gorgeous Atlanta spring/summer/autumn evening! 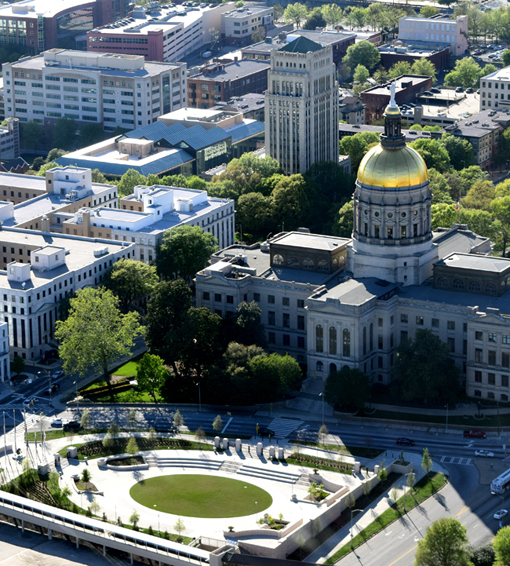 Get to know Stone Mountain intimately at Memorial Hall--which is so much more than a museum! And it'll totally enhance your Park experience! 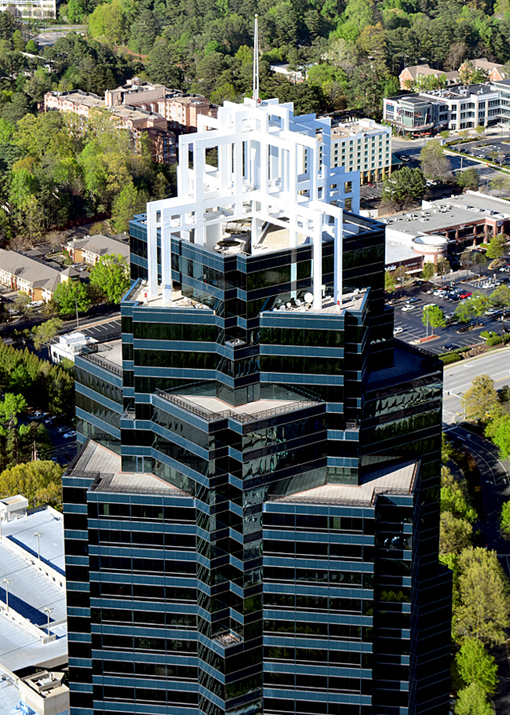 The final "stop" on our Atlanta helicopter tour was the King & Queen Towers in Sandy Springs. You know how much I love Atlanta, but to not admit that Sandy Springs has it going on, would be totally wrong. There's a lot going on here...check out their amazing restaurants (perhaps start with this year's "Food That Rocks") and their many tourist destinations! Aside from cutting our tour by 10 minutes, due to a scheduling error on their end, everything about our Select Helicopter tour was fantastic. I do recommend them and I'd happily go for another tour! Our flight departed from Peachtree-DeKalb Airport, aka PDK (they have tours originating at Lake Lanier, too). We enjoyed post-flight dinner and drinks at 57th Fighter Group, situated near PDK runways where diners can watch planes (and helicopters) take off and land. I wish I could share better in words how fantastic it is to see you home city from above. If you have any inclination to go on a helicopter tour...do! Thank you so much, Terry! Aerial photography isn't something I thought I'd be doing, even just for fun, but it was totally that...great fun!